The actual process involved in searching a crime scene depends on the type of crime that has been committed, the physical layout of the scene (is it outdoors? Is it spread over several floors of the same building?) and the evidence contained in the scene (Is hazardous or dangerous material present? Is there blood? Has there been a fire? Is there a body?). If it is a large scene, it may need to be zoned (examined as separate parts). It may also be necessary to avoid stepping on surfaces where the perpetrator has walked by using stepping plates. The CSI must will establish the point of entry (POE) and the point of egress (also POE), that is, where the perpetrator entered and left the scene of crime. This will almost always show signs of forced entry or locations where trace evidence such as fingerprints, glove marks, ear marks, footwear marks, and physical impressions such as toolmarks can be found. There may also be fragments or pieces of glass, flakes of paint, hairs and fibres, and smears of blood or saliva at the POEs, all of which will need to be protected for later recovery. Other types of evidence frequently found at crime scenes include a wide range of physical items such as knives, guns, tools, cigarette ends, discarded clothing, drugs, and traces of substances such as gun shot residues and body fluids. The list is almost endless. Once the POEs have been established, the CSI will examine the rest of the scene in a methodical and systematic way. Any evidence located at the POEs and the scene will be recorded and the evidence marked up using either numbered evidence marker boards or adhesive labels placed nearby the evidence. This will enable each individual item of evidence to be uniquely and numerically identified and photographed. Only after all items of physical evidence that are to be recovered have been located and marked-up will they then be recovered. Occasionally, several items of evidence may lie together or conceal other evidence lying beneath. For example, a knife may lie beneath a body, and not be found until the body is moved. In these instances, the CSI will record and photograph the "as-seen" items, and in the process of recovering the items, will add further numbered marker boards to the newly-revealed items before photographically recording the "new" scene. 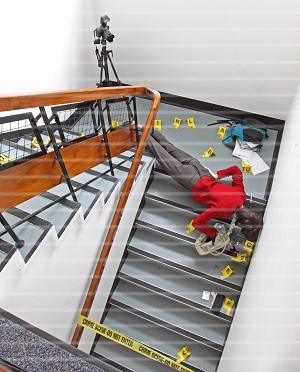 The image below shows a simulated crime scene involving a suspicious death at the start of the "Collecting Evidence" stage of the process. Several items of evidence can be seen scattered about the victim, and each of these have been marked with a yellow crime scene identifying number card. The scene also shows "POLICE CRIME SCENE - DO NOT ENTER" cordon tape and camera on tripod.